Prime Minister Theresa May looks at horses during a visit to the Royal Welsh Agricultural Show, but is she a racing certainty to lose her job? IF there was a general election tomorrow, who would I vote for? It’s a question that’s been popping into my mind with increasing frequency over the past few months, and I’m not alone in asking it. Over a drink with a bunch of friends, it turns out they’ve been wondering the same thing. The thing is, though, none of us have come up with any real answer, which is disquieting. We’re pretty representative of the electorate as a whole. None of us are members of a political party, and we’re unanimous in our agreement that no single one has a monopoly on either wisdom or good ideas. Over the years all of us have voted at various times Conservative, Labour or the Liberal Democrats, depending on their leadership and manifestos. There’s a 50-50 split between us over whether leaving the EU is a good or bad thing. 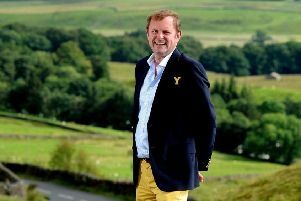 We’re evenly spread between Conservative and Labour seats in Yorkshire, where we all think our MP – some high-profile, some not – mostly does a good job of working for his or her constituents. But individual conscientiousness aside, which of the parties they represent is truly fit to govern in its current state? And that’s why it was a disquieting discussion, because the only answer we could agree was “None of the above”. This is the dilemma for the great silent majority of the electorate like my friends and I. We’re just like millions of others, floating voters who need to be won over for any party to gain power. Our concerns are those of countless others across Yorkshire and beyond – job security, paying the mortgage, the NHS, good schools and public services, living in a decent society. We’re not dogmatic but willing to listen and put our faith in sensible policies advanced by people we judge to be made of the right stuff to run the country. It was people like us who gave Margaret Thatcher a landslide election victory and then, a generation later, did the same for Tony Blair. It’s also people like us who, in our quiet way, ensure that the swivel-eyed extremists of either right or left who seem to be proliferating in Europe have never gained a foothold here. Who do we put our faith in whenever an election comes? A Conservative Party so riven by divisions over Brexit it cannot be regarded as a cohesive entity with a clear direction of travel? A Labour Party hardly less divided and dogged by the repellent spectre of anti-semitism? Liberal Democrats so muted and devoid of ideas that they are all but invisible? Disillusionment – and even despair – at the state of the parties which voters realistically have to choose between isn’t just confined to the silent majority. It is also becoming apparent within the parties themselves. Last week, a survey by the influential Conservative Home website of Tory members found widespread disapproval of the Government. The Prime Minister’s approval rating was an abysmal minus 48 per cent. Even Transport Secretary Chris Grayling fared marginally better – just. If even party members think the Government is doing a rotten job, how can floating voters put any faith in it? Yet Labour can hardly rejoice. Coincidentally, on the same day it emerged that shadow cabinet members faced possible dismissal because – with the exception of a few high-profile figures – most were making no impact on the electorate. The overall impression is of parties more concerned with arguing among themselves rather than reaching out to the country. That it should be happening at a time of enormous national uncertainty because of Brexit makes it all the more concerning. Although a general election is not imminent, one could be upon us within months if Theresa May’s fragile and fractious Government is brought down – or self-destructs. It is then that the question of who is fit to govern will come sharply into focus, and the questions that my friends and I ask ourselves take on real urgency because, if anything, the political scene is likely to be even more unsettling than it is now. The Conservatives under an untried new leader, distrusted by the wing of the party which doesn’t like his or her policies, and therefore unlikely to be able to command any more authority than Mrs May? Or a hard-left Labour under a leader who has never been near holding office, whose supporters are trying to deselect moderate MPs who don’t toe the line, even though they might be in tune with their constituents? It is the most unappealing, and worrying, choice that I, or any of my friends, will have faced as voters. Placing an X on the ballot paper used to be done in the belief that we were helping to set a firm direction for the country and our lives. The next time we do it, it’s going to represent a step into the unknown.